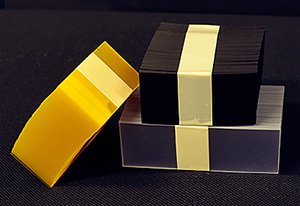 Shelf Chip, 1.25" x .010" x 1.5"
Shelf chip measures 1.25" x 1.5" x .010". Prices decrease as volume increases. Store will automatically calculate discounts. .010" Red or Blue PVC. These items are not available via our e-commerce system. Please phone, fax, e-mail or snail-mail us your order. 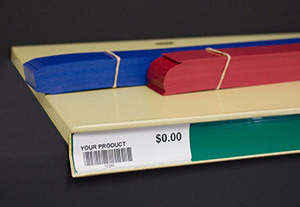 Shelf Chip, 1.22" x .015" x 2.0"
Chip measures 1.22" x 2.0" x .015". Prices decrease as volume increases. Store will automatically calculate discounts.